Quickly and easily create engineering drawings from 3D models using highly efficient drafting tools. 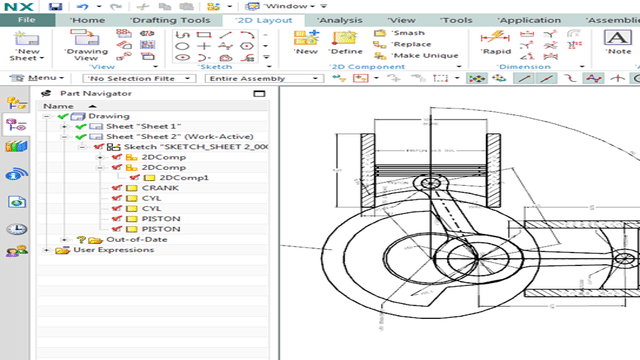 The drafting software automatically creates drawing views from 3D part and assembly models, and helps you align and scale drawing views and arrange drawing sheets. Comprehensive annotation tools document your drawings with manufacturing requirements. Advanced change tracking reduces drawing checking time and eliminates errors. Our products include powerful and productive capabilities for 2D design, layout, drafting, annotation and documentation that are ideally suited for 2D, hybrid 2D/3D and 3D design environment. Drafting & Documentation is made up of powerful features that allow you to build a custom solution. Read more about these features below. NX makes it easy to comply with major national and international drafting standards. Simply select your desired standard to make sure that all elements of your drawings are in compliance. NX Layout is an easy-to-use 2D concept design solution for NX, which is integrated with a common user interface in proven technology. It enhances 2D conceptual design with the use of intelligent, designcentric, re-usable objects called 2D components. Automatically creating an assembly based on a layout accelerates the product design phase by allowing you to explore concepts in 2D, and iterate and transfer it to 3D. Since it eliminates the need to maintain multiple systems to solve 2D design requirements, NX Layout also reduces the cost of training, maintenance and implementation. NX delivers synchronous technology for 2D, an advanced capability that accelerates editing of 2D CAD data — even files from other systems. The technology infers geometric relationships, which enables fast and efficient changes in layouts and engineering drawings.